This year Debbie and I photographed an amazing wedding at the Cinnabar Golf Club. In December it’s hard to know what kind of weather you’re really going to have to photograph an outdoor wedding. On this December day the weather was beautiful. Our couple couldn’t have asked for a better day to perform their nuptials in front of their friends and family.The day began by photographing small details important to the couple. Items to be used in the wedding. After photographing details Debbie and I went directly to Cinnabar Golf Club and begin to photograph the site, which was beautiful this time of year. Trees were still green and flowers still in bloom. When our couple arrived at Cinnabar we were ready to begin our first look. The first look involves just having the bride or the groom walk up behind the other and give them a moment where they can see each other for the first time in their wedding attire. Our couple reacted no differently than most couples, surprised, happy and affectionate. Because it’s an active golf club, we were limited to a number of different locations in which we could photograph. We directly made our way to the first location, a big oak tree on the hillside. Getting our couple to relax, ready to be photographed we were enjoying the moment but we were short of time. So we decided the best approach would be to photograph the entire bridal party. This is one of those times that it really pays to have two photographers that know each other well. I set the photograph by placing the bridal party on hillside holding hands walking in one direction. It was Debbie who really captures the essence of the moment. 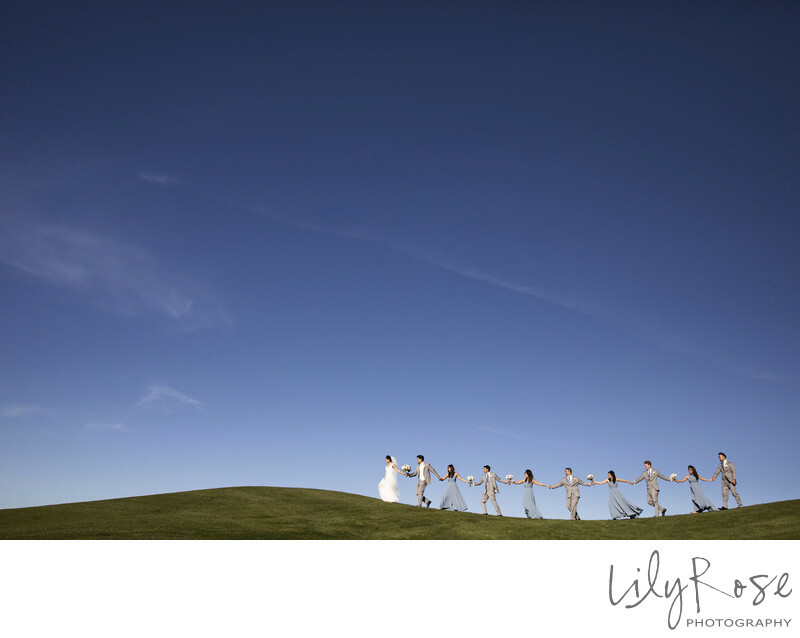 She stepped back and was able to capture the entitled bridal party as they walked along the ridge-line of the golf course holding hands. These two locations were really the only two locations available to us as golfers were busy playing on this day. The overall image is quite pleasing in fact at a recent print competition in Las Vegas at Wedding and Portrait Photographers International; Debbie was awarded a silver distinction award for this very image. The rest of the wedding day proceeded like many others. We were fortunate to capture this image and many more beautiful pictures for our couple. I’m not sure that I have found anything else in my life quite as rewarding as capturing these beautiful moments for our wedding couples. Location: 23600 McKean Rd, San Jose, CA 95141.